Lt. Gov. Stack; Speaker Turzai; President Scarnati; Leader Corman; Leader Costa; Leader Reed; Leader Dermody; Members of the General Assembly; and, above all my fellow Pennsylvanians. Also, my Mom and Dad. In January, we gathered outside in the cold as I took the oath of office. Six weeks later, I am sorry to say that it is still just as cold. So I’d like to move from something we can’t control to something we can – the budget. I am grateful for the opportunity to discuss how we can ensure that Pennsylvania’s future is as bright as our incredible past. As you know, I campaigned on the idea that we need a new approach to governing Pennsylvania — one that challenges the status quo and takes on old problems in fundamentally new ways. And one of the old problems we need to put to rest is the idea that Democrats and Republicans can’t work together to solve Pennsylvania’s problems. And that’s why I have made it a priority the past six weeks to meet with just about every Member of this body, both Democrats and Republicans. I want to thank all of you for sharing your ideas – on the issues where we agree, and especially on the issues where we don’t agree. I learned as a business owner that you can disagree with people without being disagreeable and that on every issue, if you are willing to talk, there’s a better chance that you can find truths that both sides can share. As I said six weeks ago, the people of Pennsylvania need leaders today who are willing to listen to each other and learn from each other and work together to give all the people of this state a shot at a great life. That’s the different kind of approach we need to take to move Pennsylvania forward. And that’s why the proposal I’m unveiling today is a different kind of budget. It is a budget that reflects my conversations with many of you here today. It includes democratic ideas, republican ideas, and ideas that exist beyond party lines. It is rooted in the values of fairness, inclusion, and common sense. It is a balanced budget, and it eliminates our $2.3 billion deficit. But above all, it is also a budget that recognizes that Pennsylvania will not improve until we rebuild the middle class. And it does so while cutting the property tax paid by the average homeowner by 50 percent and reducing the total tax burden on average, middle-class families. These are some of the things I have talked about since I started running for governor two years ago. And third, government that works: because for our state to be great again, we need a government that is more efficient and less wasteful. One that restores faith in the fundamental notion that our democracy still works. We need a new approach – and we need to question the decisions that got us to where we are today. For example, why are we paying Wall Street managers hundreds of millions of dollars to manage our pension fund? That doesn’t help our middle class, it doesn’t help our seniors, and it needs to change. Why is Pennsylvania ranked at the bottom in job growth? Pennsylvania has the resources to create jobs. Too many teachers have left the classroom due to budget cuts. With us today is a teacher named Katy Beth Klinger. Katy was a teacher in the Reading School District – where she saw the difference she was making in children’s lives at a school district that was severely underfunded. But in 2011 she was part of a mass furlough. Since then, she has not been able to return to permanent work. Katy just wants to teach and help the students who she saw making real progress before the education cuts. She has stuck with it, though. Katy has been a substitute at the Reading School District. When people ask her why she doesn’t change careers or seek a position in another school district, she says she can make a bigger difference in the city of Reading with the children who need help the most. Katy is a single mother and the stress of not knowing whether she can count on a stable income from year to year has been weighing on her. We need more teachers like Katy in our schools. We need teachers like Katy to make sure that our students in Reading, Philadelphia, Lock Haven, Towanda – can get the education they need to succeed in Pennsylvania. My budget puts teachers like Katy back in the classroom. To create jobs that pay, schools that teach, and government that works, we have to do things differently. That is what this budget achieves. Our commitment to education is historic. We are starting with education because, in many ways, education is at the core of everything else that we want to achieve. When I ran a business, finding talented people with a strong education was my highest priority. It’s what made us competitive in the marketplace. A great public education system will help Pennsylvania attract new businesses, retain talent, and grow the middle class. We need schools that help teach our kids the 21st century skills they need to compete and win against kids from China and India and Germany. Over the past four years, Pennsylvania took a step in the wrong direction by trying to balance our state budget on the backs of our schools. It left us with 25,000 educators out of work. It forced 75 percent of school districts to cut academic programs. It forced 70 percent of our school districts to increase class sizes. It left 56 percent of Pennsylvania students with no access to a full-time librarian. And it forced too many schools to cut art and band to pay for reading and math. My fellow Pennsylvanians: this is not a formula for success. It’s just this simple: our state is never going to get stronger as long as we make our schools weaker. And that is why the very first thing my budget does is restore the $1 billion in cuts to public education that occurred under the previous administration. But this is not going to stop at simply reversing cuts that already took place. We can’t— because the way things were before is not good enough. For too long, we haven’t paid enough attention to the fact that Pennsylvania ranks near the bottom of the country in state investments in Kindergarten through 12th grade education. This budget increases our investment in public schools at every grade level. It also recognizes that our responsibility to provide a great education does not begin at kindergarten and end with high school. That’s why my budget also expands access to early childhood education by increasing the number of children in Pre-K by 75 percent. That’s why we are increasing funding to community colleges by $15 million. And that is why we are restoring 50 percent of the cuts to our state system of higher education. But those improvements come with a string attached. In return for these increases, today I am calling on our institutions of higher education to freeze tuition, and I expect them to answer that call. These investments in higher education and community colleges will help prepare our young people for jobs that pay. However, our budget doesn’t just spend more on schools. It also includes accountability measures to make sure that this money is spent on classrooms, not on bureaucracy. But that’s not the only thing that makes this budget’s commitment to education historic. For the first time in more than 40 years, we are proposing to increase the state’s share of funding for public education to 50 percent. Today, the state contributes just over 35 percent of the total cost of public education. That ranks us far below the national average, worse than Alabama – worse than Mississippi – and worse than West Virginia. As a result, here in Pennsylvania, more of the cost falls on local communities, largely in the form of property taxes that disproportionately burden lower income homeowners and seniors living on a fixed income. Furthermore, Pennsylvania is one of only three states that does not use a funding formula to distribute education dollars to local districts. That means poorer urban and rural districts are not getting the help that they need. The gap in spending between rich districts and poor districts has exploded. A bipartisan commission is developing a fair funding formula to no doubt correct that. And so will my budget. The funding formula we are proposing would provide more money to all districts, which will help alleviate the burden on local property owners. But our proposal will pay special attention to where the challenges are the greatest. It will ensure that education funds are distributed in a manner that is efficient, equitable, and transparent. It will help take favoritism out of the process, because if we know anything, we know that school funding should be a matter of need, not politics. Instead, it will tie funding to specific factors such as district size, poverty levels, and student makeup. And it will incentivize school districts to develop innovative programs that improve student achievement and hold down costs. I look forward to the commission’s proposal. Together we will get this right. If Pennsylvania is going to be one of the best places to get an education, we can no longer afford to be one of the worst in funding our schools. We need a historic commitment to education – and we’re making it today. Now, I’m sure that all sounds great, but many of you are wondering: how are we going to pay for it? You might hear me talking about education funding and assume that means your taxes will go up. But in fact, my budget actually reduces the total tax burden on average middle-class homeowners by 13 percent. We will do it with tax reforms that are smart, pragmatic, and fair. We will do it with changes that will help eliminate the deficit, protect the middle class, and set the table for robust private sector growth. It starts by doing what every other major gas producing state has already done. We are going to place a severance tax on the extraction of natural gas. And we are going to tie the revenues from the tax to funding for public education. Our plan is known officially as the Pennsylvania Education Reinvestment Act. I am proposing a five percent severance tax that is projected to generate more than $1 billion in annual revenues. The impact fee dollars are preserved and will continue to support communities where drilling takes place. So, under my plan, while local communities will continue to receive funding to address the impact of the drilling, the bulk of these funds will be used to invest in public education. This is not about politics or ideology. Natural gas production is growing faster in Pennsylvania than anywhere else in the country. Yet, we are the only major producer of natural gas that does not ask drillers to pay their fair share or provide a return on our resources. The fact is, consumers in Pennsylvania are already paying a severance tax every time they fill up their tanks with gasoline, only they are paying it in Oklahoma, Texas, West Virginia, and every other state with a tax on oil and gas drilling. Why should those states get our money without Pennsylvania getting some of theirs in return? This is not a partisan idea. This is a recognition that Pennsylvanians are getting a bad deal. We deserve to be fairly compensated for the use of our resources. The benefits of this change don’t end there, either. By shifting the cost of public education away from local districts, we are also going to drastically reduce property taxes. This is something Republican House Majority Leader Dave Reed has championed, and many Republicans have supported it, from all over the state. Last July, he introduced a bill to lower school property taxes, and our plans share common goals and similar approaches. So this is truly a bipartisan issue. Overall, my budget will reduce the average homeowner’s property taxes by 50 percent, putting more than $1,000 each year in their pockets. This will ease the burden on low income and middle-class homeowners. And it will bring some much-needed relief to seniors living on fixed incomes, some of whom have been forced to leave homes they have lived in their entire lives because they cannot afford higher property taxes. In fact, under my plan, many senior citizens will see their property taxes eliminated altogether. My plan raises the personal income tax to 3.7 percent. It is the same rate that Leader Reed has proposed, but less of an increase than what some other Republican legislators have proposed. And it will make up for lost revenue by increasing the sales tax from 6 to 6.6 percent, while broadening the base to include services that currently are not taxed because special interest groups have lobbied for special exemptions. This is a similar approach to House and Senate bills 76 which have been championed by many Republican and Democratic lawmakers. These changes will allow us to make a historic commitment to our schools in a way that is fairer, more equitable, and more sustainable. Let’s talk about improving our economy. As a business owner, I know that the free market requires a constructive partner in government. That means our government should not do everything, but it cannot do nothing either. One thing that it can do to create more economic opportunity is make smart investments in public goods that are strategic, not episodic. We need to do a better job of connecting our transportation systems, starting with our three world-class ports in Philadelphia, Pittsburgh, and Erie. This budget seeks to build on public/private investments created by Act 89 to turn our state into a world-class transportation hub to drive private sector growth. Another thing we must do is bring manufacturing jobs back to our state and that’s exactly what I plan to do. We propose the creation of a “Made in Pennsylvania” cash-back jobs program. In our Grant and Loan Programs we should give priority to Pennsylvania companies. Now to grow our middle class, our citizens must have access to the education and training that today’s jobs require. That’s why we are proposing to restore job training and apprenticeship programs at our community colleges, to help middle-class families make the transition to jobs in this new economy. In Pennsylvania, we are also blessed with an abundance of natural resources: gas, timber, coal, sun, wind, fresh water, open spaces, agricultural land, beautiful scenery, and an opportune location that makes us the Keystone State. Not long ago, we were one of the top wind and solar-producing states in the country, using the green economy to create jobs. But we took our eye off the ball and fell behind. To fulfill our potential, we must take full and responsible advantage of these resources. Right now, we export raw products like timber to other states and countries, who then use those raw materials to create higher-value products like kitchen cabinets. Why can’t we make those high-value products right here in Pennsylvania? That way, we’ll have both the resources and the jobs that those resources make possible. We will train Pennsylvanians to work in the shale fields. Pennsylvanians will manufacture the steel pipe and the tanks to transport and hold the gas, and the technologies to clean the water. With shale gas, we can offer affordable energy, and we can provide the feedstocks needed in advanced manufacturing industries. Our natural resources; our well-trained and well-paid workforce; our growing businesses. That’s what my plan enables us to achieve together. If we want to be a state where the next generation can envision a bright future, Pennsylvania has to offer a level playing field where entrepreneurs can be confident their risks will be fairly rewarded. Workers have to be fairly rewarded, too. The companies and countries that are thriving in today’s global economy are those that are committed to diversity, inclusion, and fairness. All of Pennsylvania’s families deserve those same opportunities, no matter what their race, sexual orientation, where they started life, or who they are. Our state has also long believed that hard work should be rewarded. Yet, a full-time worker earning minimum wage makes about $15,000 a year. For a family with two kids, that’s below the poverty line. About 20 percent of Pennsylvanians live on that edge every day. I strongly believe that nobody who works full-time should be forced to live in poverty. That’s why I’m calling on this legislature to raise the state minimum wage to $10.10 an hour. You all know the company that I built has a profit sharing plan. It’s because I believe that my people deserve to share in the benefits of their hard work, but also it makes my company better. Paying good wages is not just the right thing to do, it is the smart thing to do. That is how we are going to grow the economy. If we are going to lead in the 21st Century, we can’t do it with a tax code that takes us back to some of the worst decisions of the last century. Now, cutting the property tax as I described earlier will help reduce the burden on businesses, making it more attractive to locate businesses in our towns and cities. But there is much more we need to do. Which brings me to the corporate net income tax. Today, the corporate net income tax rate in Pennsylvania is 9.99 percent – one of the highest in the country. That is driving jobs out of our state. At the same time, loopholes in that tax code allow many companies to avoid paying state income taxes altogether. Because of these loopholes, more than 70 percent of companies that do business in Pennsylvania do not pay corporate net income taxes at all. That forces more of the burden onto small businesses and families across our state. In other words, the problem is not only that our corporate net income tax rate is too high. The problem is that we are not even seeing the revenues the tax is supposed to generate. It is the worst of both possible worlds. My budget will close the Delaware loophole and cut the corporate net income tax rate by 40 percent in the first year and 50 percent by 2018. That will take us from the one of the highest in the country to one of the lowest in the country. And that will incentivize companies to come here and create good jobs in Pennsylvania, while also ensuring that corporations pay their fair share. For 17 years we talked about phasing out the Capital Stock and Franchise tax, and now we are going to do it. Let’s talk about health care. At a time when health care costs are placing a burden on every state government, we are also going to expand the Medicaid program by accepting the funds made available under the Affordable Care Act. And, we will restore a small amount of funding for health and human services to the county level for our most vulnerable populations. It’s not a lot of money, but it is important money. By consolidating some of the programs launched by the last Administration, our Medicaid changes make the program better and save more. The changes that I am proposing today are not just about raising money. They are about making the government work better, and making it work for everyone. Since my first day in office, my Administration has been committed to government reforms that increase efficiency, reduce waste, and eliminate cronyism and corruption. Our government should be transparent and fully accountable. Taxpayers deserve to know how every penny is spent. That’s why one of my first acts was to issue Executive Orders forbidding employees of the executive branch from accepting gifts, and banning no-bid legal contracts that have wasted millions of taxpayer dollars. 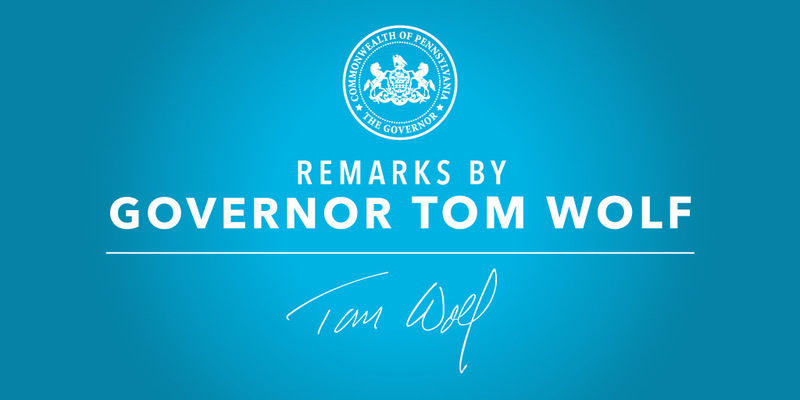 We also established the Governor’s Office of Transformation, Innovation, Management, and Efficiency to find ways to streamline management and better serve Pennsylvania’s citizens. The new office will focus on improving coordination between agencies, modernizing state government operations, and seeking out partnerships with the private sector. Right now, our state agencies are given incentives to spend every dollar. If they don’t spend their entire budget, their budget will likely be cut next year. But it is perverse. It’s shortsighted. And it needs to change. Instead, we are going to give state agencies incentives to save money. We expect these efforts to generate up to $150 million in immediate savings and hundreds of millions over the long term. And we are looking at even more reforms to make the government more responsible and responsive to the people it serves. For instance, we are going to modernize state-run liquor stores to make them more consumer-friendly. And we are going to make the state and municipal pension system stronger. Believe it or not, as I mentioned earlier: our state has been wasting hundreds of millions of taxpayer dollars on Wall Street managers to handle state pension accounts. But studies have shown that simply investing this money in a safe, conservative account would produce a similar return over the long term while eliminating these excessive management fees. We are going to stop excessive fees to Wall Street managers. We’re going to improve retirement security for state workers. With these and other improvements, we are going to save taxpayers nearly 1.3 billion dollars over the next five years while creating savings of 10 billion dollars in the unfunded liability. Individually, these reforms aim to increase efficiency and eliminate wasteful spending. But taken together, they make big strides toward a larger goal: a government that works. Another part of government that works is restoring trust. And that’s why I look forward to working with the legislature on other reforms that will improve people’s trust in government like campaign finance and redistricting reform. So this is a budget that respects and honors the great potential of this state and its people. The ideas that I am proposing today represent a starting point, and we need to get started right away. Because, today, Pennsylvania stands at a crossroads. We have a $2.3 billion deficit, an education crisis, and a sluggish economy. Our credit rating has been downgraded five times in a row, making us one of the least creditworthy states in the nation. And since the beginning of 2011, Pennsylvania has been near the bottom in the country in job creation. I’m not here to assign blame or pretend that I have all the answers. The reality is that times have changed, and ideas that may have worked in the past simply aren’t working anymore. It’s time to do something different, and work together to get the state back on track. Our budget should be as bold and ambitious as Pennsylvania has been for over 300 years. Today, I laid out my plan, and I’m going to fight for it. I recognize that some of you won’t agree with all or parts of it, and I recognize that we’re going to have a robust conversation. That’s how our democracy works. But if you don’t agree with my ideas, here is my request: please come with your own ideas. It’s not good enough to just say no and continue with the same old same old. That’s our responsibility to the people of Pennsylvania. They may have voted for divided government, but they did not vote for gridlock. We have to find ways to deliver the solutions that we promised. I want ambitious people to see Pennsylvania as the best place to begin a career. I want them to have confidence that if they come here and take a risk, it will pay off. I ran for governor because I refuse to be part of the first generation of Pennsylvanians forced to tell their kids that they need to go somewhere else to succeed. I know that we can get our state back on track because we still have all the qualities that make Pennsylvania so great. We still have the most innovative, resilient people anywhere. There is no reason why we can’t have the best schools. There is no reason why we can’t have the most dynamic economy. There is no reason why we can’t have the strongest middle class. The idea of Pennsylvania is the idea that all things are possible. And if we work together, there is nothing that we can’t accomplish. We are the state that built America. Let’s be the generation that rebuilds Pennsylvania. Thank you, and God Bless the Commonwealth of Pennsylvania.